NOT For True Fair Skins!! 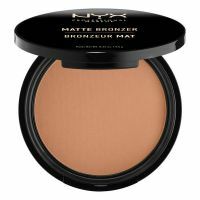 I like this bronzer because it isn't sparkly like other bronzers and is great when you want just a little bit of a glow. I recommend finding the light shade if you have a fair or light skin tone. I am a medium skin tone, and I am always looking for a good summer bronzer. I self tan a lot and I like to be bronzed, but finding a good bronzer with strong color payoff at the drugstore can be tricky, AND it's matte!! I love matte bronzers like hula by benefit, and I love this bronzer.